ASEZ, the Church of God University Student Volunteers, carries out diverse projects on campus with faith and love, to protect the environment and to make a better world. Filled with knowledge in mind and passion in heart, they had a special vacation in many places of the world, working hard in one mind for a good cause. More than 250 Korean students flew to 33 cities of 23 countries to promote cultural exchange, and performed volunteer services with local students and members on a large scale. Their activities were designed to achieve the Sustainable Development Goals [SDGs] adopted by the UN in 2015. It is a set of 17 “global goals” with 169 targets, such as environmental protection, combat desertification, no poverty, and quality education, which involves UN Member States. The UN suggests volunteerism as one of the contributors to its achievement. By encouraging people as well as governments and NGOs to participate and strengthening their ownership of the agenda, the goal of sustainable cities and communities can be realized successfully. ASEZ in Washington D.C. was invited to the UN Headquarters. ASEZ in Raipur, India, agreed to continue to cooperate with Kalinga University. As a part of it, ASEZ focused on Mother’s Street Project to give an impetus to our good deeds and to encourage people’s participation. The project is about designating a 1-km-long street in need of environmental improvements as Mother’s Street and carrying out a cleanup once a month. Its goal is to clean 40,000 km, the circumference of the earth. In 2015, when the project was undertaken for the first time in Kathmandu, Nepal, local residents and governments welcomed it, and there are eleven Mother’s Streets as of now in Nepal. University students carried out environmental cleanups. They swept and removed rubbish despite heat waves with temperatures reaching 40°C [104 °F], humidity levels near 90%, or downpours of rain in the cities located in the northern hemisphere such as Tokyo in Japan, Ulaanbaatar in Mongolia, Washington D.C. in the U.S., Munich in Germany, Madrid in Spain, and London in the U.K. In the cities located in the southern hemisphere such as Tshwane in Rep. of South Africa, Porto Alegre in Brazil, and Santa Fe in Argentina, they performed street cleanups in chilly, early winter weather. They dug the hard ground and planted hundreds of trees in Sydney, Australia, and in Córdoba, the second most populous city of Argentina, suffering from serious desertification. They also implemented Crime Prevention Through Environmental Design [CPTED]. It is a crime prevention theory focusing on tactical design and the effective use of the built environment. Its examples are painting murals and installing outdoor LED security lights or mirrors. The students demonstrated their outstanding creativity in painting walls in Bangalore, India, and brightened up the streets. Such activities do not stop at making streets clean temporarily. The ultimate purpose is to change public perception of the environmental protection, and to enlighten residents including university students, who are the future leaders of each country, about the importance of practice, so that they may participate in volunteer services. It is to help local residents keep streets clean and safe and take the lead in maintaining their own communities, even after ASEZ members go back to Korea. For this, ASEZ held environmental seminars for students and citizens in Washington D.C. in the U.S., Manila in the Philippines, Kathmandu in Nepal, and so on. The attitude of students and citizens changed noticeably during the volunteer services. Citizens in many cities joined the work actively and some students discussed the plan for the future activities, brightening the prospects for the project. Inspired by the work of ASEZ, the UN invited ASEZ in Washington D.C. to the UN Headquarters and planted a vision and passion for the future. Around ten organizations and universities, including the City Hall of Tshwane in Rep. of South Africa, signed MOUs with ASEZ, agreeing to support and work together continually. Local governments, citizens, and students built a foundation for sustainable volunteer service system. “I want to change dark streets where crimes are committed into bright and lively ones where markets and concerts are held and where young people show their works of art. I want to help you change streets and cities. Please contact me anytime,” said Solly Msimanga, Mayor of Tshwane, showing support for ASEZ. “I didn’t think I could afford some time for volunteer services, as I had been overwhelmed with worries about my career and qualifications. But through this opportunity, I’ve learned that when the world changes with my help, then my future becomes better accordingly. I will make efforts to serve others so that everyone’s future can be bright,” said Brother Song Min-yeong (from Sangmyung University). Young adulthood is usually when they possess knowledge and acting power most. It is natural that people expect them to deal with worsening environmental issues and complicated social problems. In reality, however, they are accustomed to individualism, and don’t willingly step forward to make an altruistic endeavor, being pressed with economic recession and unemployment crisis. A UN survey found out that 18–24 year-olds showed the lowest participation rate in voluntary works, and the U.S. Department of Labor reported that the volunteer rates among 20–24 year-olds are the lowest in comparison with other age groups. Now, the world requires the passion and action of young adults. 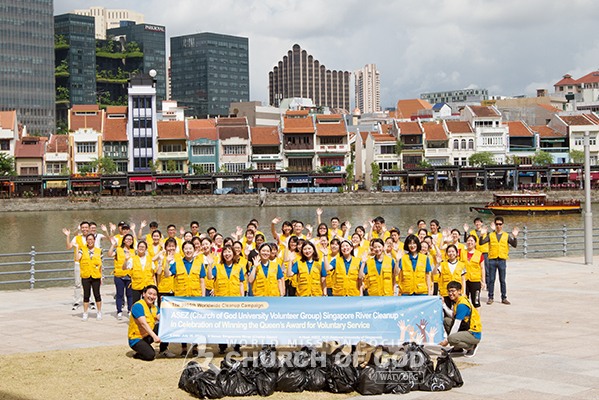 ASEZ students, who cherish God’s love, help global neighbors change for the clean and happy environment for all of us.